YInMn blue. Credit: Oregon State University. Mas Subramanian, a chemist at Oregon State University, was one-day mixing inorganic compounds for some electronics applications. He didn’t make the material he was looking for, but instead created a vibrant shade of blue that’s completely new. Not only does it look gorgeous, it also has many remarkable properties that could transform the way artists work, but also save energy for households. The new pigment is called YInMn blue, a tribute to its three constituting elements — Yttrium, Indium and Manganese. To make it, Subramanian and colleagues mixed black manganese oxide with other chemicals and heated the whole mixture to 2,000 degrees Fahrenheit. Voilà! Pigments — the stuff that gives matter color — are usually mined from the earth in the form of clay, minerals or even plants. The oldest human works of arts still visible today in 40,000-years-old cave paintings were made with lead oxide (Pb3O4). Synthetic pigments significantly increased the colour pallet at our disposal, but not all pigments are equally reliable (durability) or safe (toxicity). The price can also matter. One extensively used blue pigment, for instance, is ultramarine. It’s made from ground lapis lazuli (a deep blue semi-precious stone prized since antiquity for its intense colour) and it can be quite expensive. Meanwhile, alternatives like cobalt blue and Prussian blue are very toxic. 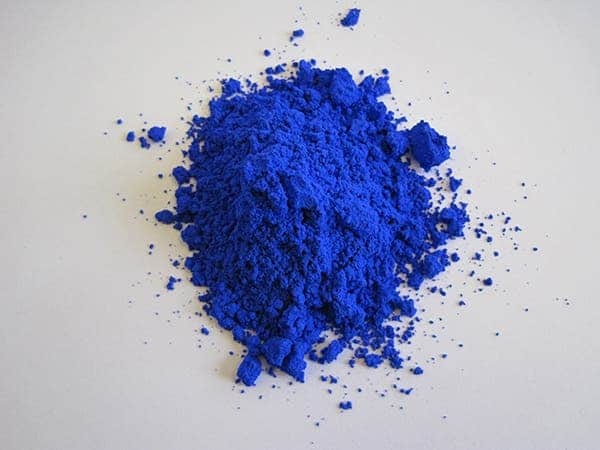 YInMn blue proved to be an excellent pigment for art since its crystal structure keeps the color from fading, even when exposed to oil or water. It’s also more durable and easier to produce than other blue pigments. It could also significantly improve energy efficiency. Tests show the pigment reflects a lot of infrared rays, so a roof painted in YInMn blue would not only look splendid, but also keep the house cool. 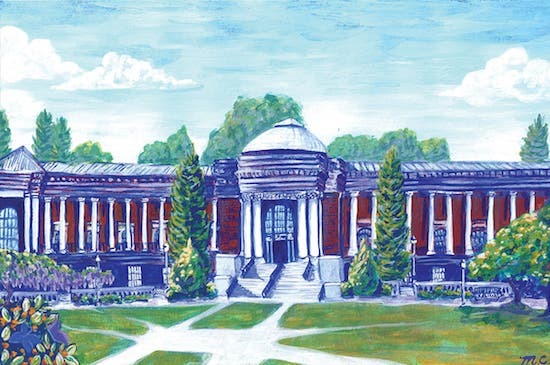 OSU Memorial Union Façade by Madelaine Corbin. The work used the YInMn for the blue. More research on YInMn is still in the works, but meanwhile those interested can already order the pigment from the Shepherd Color Company. The pigment is already present in the Forbes Pigment Collection at Harvard Art Museums — the most colorful place in the world where more than 2,500 pigments are housed, some dating from the Middle Ages.